He said that he used to get questions from his clients about how to lose weight, but in recent years the questions have changed. ‘I want to be able to run a 5K with my kids, and not be in pain during or after.’ or ‘I want to go skiing with my husband this winter. Can you get me in shape for that?’ It’s what your podcast is all about. He shared some “don’t miss” exercises that all women over 50 should be doing and ways to stay fit when you only have 15 minutes to work out. With more than 15 years working in the fitness industry, Brian Kennell has worked at sports performance facilities and a medically based fitness facility – as both a trainer and manager. He now has his own personal training business, BKennellFit, where he will travel and meet people to train on location – at a park, on the trails or their home. 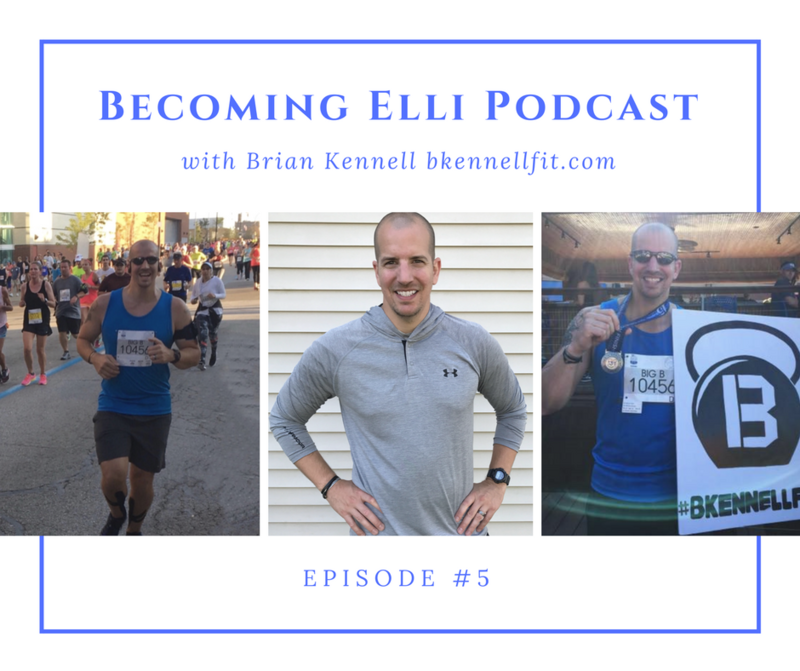 Brian has a Bachelor’s degree in Exercise Science and a Master’s Degree in Exercise Physiology/Adult Fitness, both from The University of Akron. He wrote his Master’s thesis on a popular supplement ingredient and also had a poster presentation at ACSM National Conference. While he was not very athletic as a kid, he loved sports but felt that he didn’t really excel at anything. After he began lifting weights in college, it all came together. Since then, he has competed in natural bodybuilding competition, started training for powerlifting, ran a half marathon, and is training for a full marathon. Stay in touch with us! We love to hear from you. Either leave a comment below or send an email to Chris chris@becomingelli.com or Jill jill@becomingelli.com. A friend told me about reading these and how interesting they are. I am 56 soon 57 . I work on my feet all day as I’m kinda high strung and love to keep moving. I walk on my treadmill and do small weights and bands here at home. I recently joined a gym and I love it.. my new favorite is the elliptical..
Oh I do the stairs ,can do 6-7 minutes then do all the othe machines..elliptical I’m up to 13 minutes and really makes me feel good..my friend said she ran across a podcast of yours that women over 50 should not do elliptical??? Thanks so much for leaving a comment about the podcast. So glad you and your friend are enjoying our podcasts and blog. I should have clarified about the elliptical – there is nothing wrong with it at all. During the podcast Brian was talking about how just doing one exercise (the elliptical machine) and then going home is not enough for women over 50 — that they should be doing some weight lifting as well. The fact that you’re doing some small weights and bands at home is great. I also love being on the elliptical. It’s not bad on the joints and it does feel good. In the podcast, he was talking about doing more along with the elliptical machine. Keep up what you’re doing – stairs are a great workout too! I use the elliptical too sometimes. I used to be an avid elliptical user but eventually moved to running. I’m sure Brian meant we shouldn’t just be doing cardio. We need some strength training and probably some flexibility work too. It sounds like you’re doing great, Lori. I’m so glad you found us. We can all learn from each other, that’s for sure.